Sport, Dance, Football, Basketball, Recorders, Fitness, Netball, Cross-Country, Art, Web Club, Athletics, ICT, Multi-Skills, Italian, Cookery, Textiles, Homework, Reading and Story Club. Please see the 'School Clubs' page for more information. 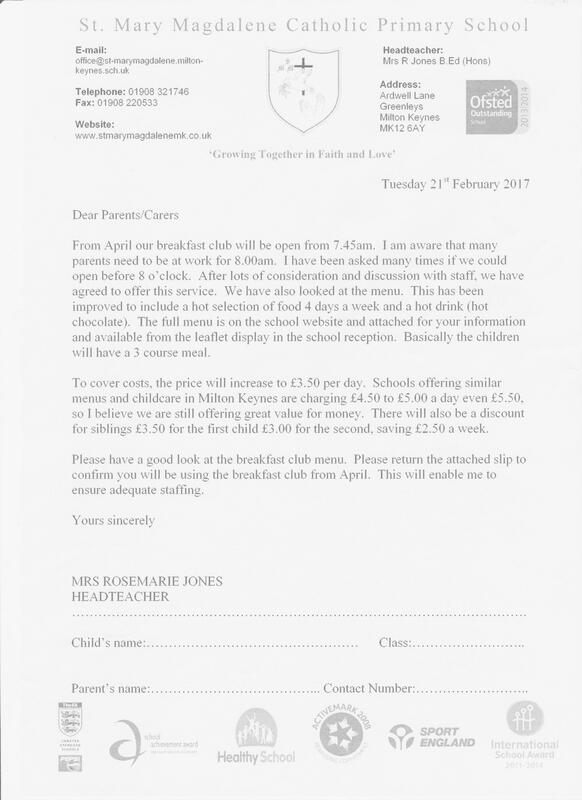 St Mary Magdalene school offers ‘early morning’ childcare through our successful ‘Breakfast Club’. The club operates daily 7.45am-8.50am. Children are given a choice of breakfast including bacon, egg, sausages, toast/beans/cereal, fresh fruit and a drink. After school care is offered by our after school club. This operates term time only 3.00pm-6.00pm. Pupils are supervised by school staff. Pupils are offered a range of activities. They are also provided with a healthy light tea. The school offers a summer club Monday-Friday 8.00am-6.00pm. Parents need to provide their child with a packed lunch. We offer additional nursery care. Currently nursery pupils are entitled to 15 hours free nursery provision. Parents may purchase additional day care of up to 15 hours per week at a daily rate. There are a variety of options available. Parents must provide their child with a packed lunch or book a hot lunch. All extended activities are led by staff employed at the school. This provides continuity and familiarity which parents greatly value.